Mobile climate monitoring cannot get any better than this! 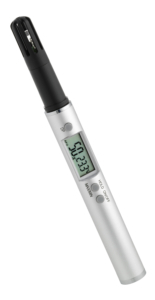 This professional thermo-hygrometer from TFA with a sturdy metal case is no bigger than a ballpoint pen – and thanks to the clip, it can be attached just as well. 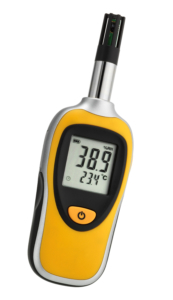 A useful device that you can take anywhere and use it for quick climate measurements. In addition, maximum and minimum reading values can be displayed and the device has a difference function. Whether for a healthy indoor climate, ideal conditions in the greenhouse and laboratory or the optimal climate in storage rooms and test rooms – the Thermo-Hygrometer is suitable for measurements in various fields.